Fig. 2 Egyptian concept of the Red Eye of Horus (Mercury) ready for launch to carry the soul of the pharaoh to the stars. 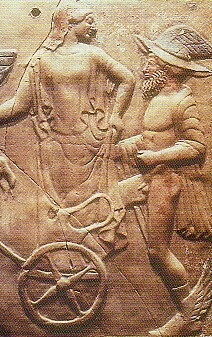 and iron and was a brightly glowing, pristine body at that date except for a number of parallel linear gouges in its coating due to the sharp rocks surrounding the Valles Marineris through which it exited, interestingly described as the ‘double-doors’ in Egyptian funerary texts of Pepi I. 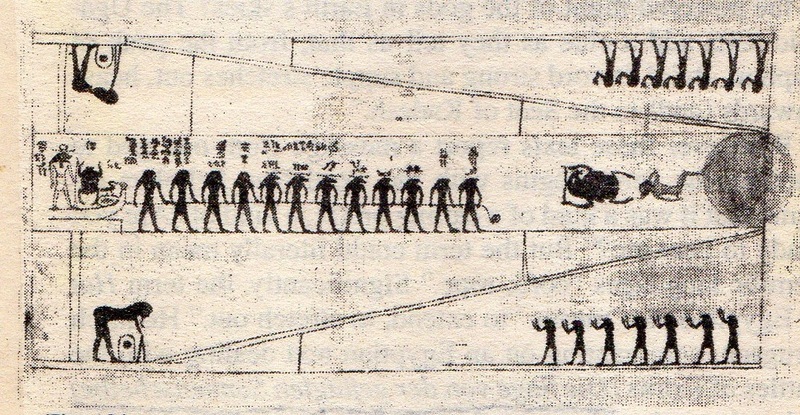 The linear gouges were the basis of the Greek myth that Hermes invented the Lyre, and were designated the ‘Mercurian Grid’ as a result of photographs returned from Mariner 10 (Fig. 1). One of these encounters with proto-Venus was so close that a deposit of basalt was left on the surface of Mercury, which can be seen to this day, close to the north pole of Mercury, mineralogically different from the rest of its surface. 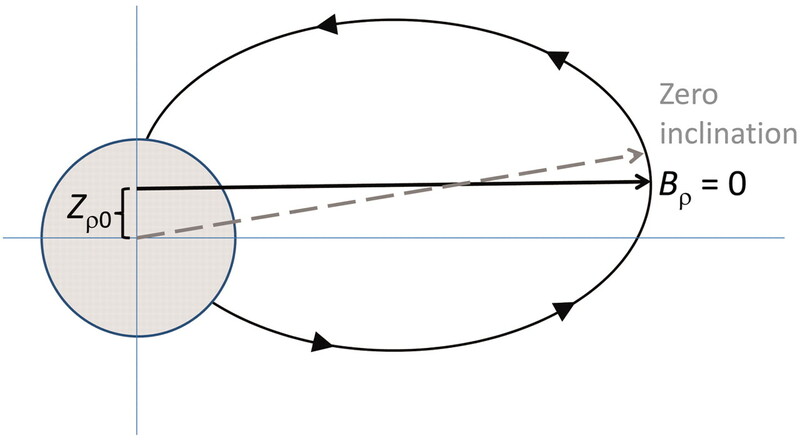 When the two bodies approached one another, Mercury, being essentially a rigid sphere of iron, was not distorted, but proto-Venus, essentially a molten sphere of iron and basalt, was drawn into a tear-drop shape by the tidal effect of Mercury during the encounter, resulting in the deposit of basalt from the narrow tip, but immediately returned to its spherical shape. 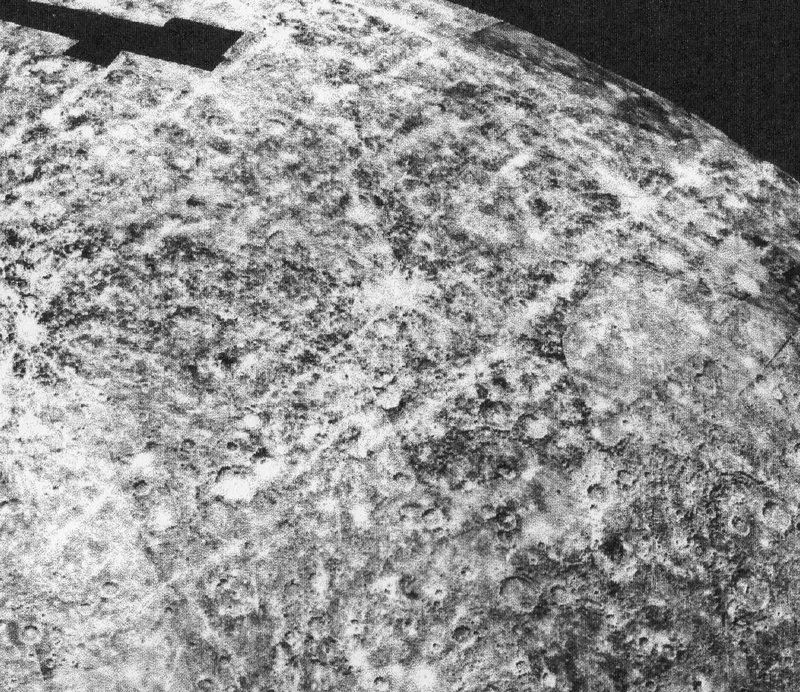 The Soviet landers sampled the surface crust of (still) proto-Venus and determined its basalt composition. Mercury’s unique dipole magnetic field plus Mars’ current lack of a global field, demonstrate that global magnetic fields are the result of high pressure superconductors (FeH?) in the solid cores and not of the touted ‘dynamo effect’. Mercury’s field is weakening because the high pressure required, the overburden of Mars, was removed in 687 BC. However, at the date of the deposit from proto-Venus, Mercury’s field was much stronger and the basalt deposit hardened, acquiring a strong remnant field. The presence of this magnetized deposit or ‘northern rise’ ~1000 km across and 1.5 km above the surrounding terrain, near the north pole of Mercury has influenced the apparent global magnetic field, producing a significant quadrapole to dipole ratio in the field as measured by MESSENGER (determined by the latitude at which the radial field is zero), resulting in the global dipole field appearing to be displaced 484 km north of the the center of Mercury. 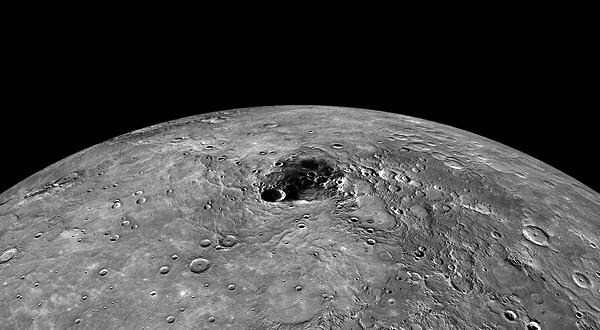 The rigidity of Mercury is illustrated by the fact that the basalt ‘rise’ exhibits a positive free-air gravity anomaly, meaning essentially that it sits atop the original planetary surface. ~ by Angiras on May 19, 2015.